Workers are putting the final touches this month on the Shady Grove Trail Connection, an important addition to the citys hike and bike trail system that broke ground in November. does just that  ties three existing trail ends together in the southern portion of the city to improve both east-west and north-south pedestrian access. The new path runs from the Shady Grove/Rapp Road intersection west to the Rapp Road/Muirfield Road intersection, cutting through a large power line easement and completing a 4.75-mile trail that continues south to the commercial hub at Rufe Snow/North Tarrant and beyond. At its midpoint, the path links into the trail on Rufe Snow Drive, which residents can follow north all the way into Keller Town Center. 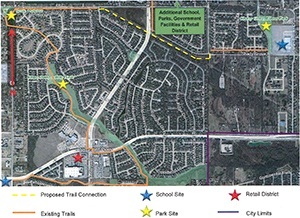 The recipient of a $401,606 Transportation Enhancement Program grant from the state, the Shady Grove Trail Connection provides an off-road link between 11 neighborhoods, Shady Grove Elementary School, South Keller Intermediate School, Indian Springs Middle School, Willis Coves Open Space and the Chase Oaks Activity Node. Via the Rufe Snow hike and bike trail, it also provides access to eight miles of existing contiguous trails throughout the heart of Keller, as well as to additional neighborhoods, Bear Creek Intermediate School, the Keller Sports Park, Bear Creek Park, The Parks at Town Center, the Keller-Smithfield Activity Node, Keller Town Hall, the KISD Natatorium, the Keller Police Department, The Keller Pointe, and the restaurants and retail of Keller Town Center. From Town Center, sidewalks connect pedestrians to Keller High School and the KISD Stadium, the Keller Senior Activities Center, the Keller Public Library and Johnson Road Park. For more information about the Shady Grove Trail Connection, please contact the Parks and Recreation Department at 817-743-4050.